Sept. 16 1913. The Sept. meeting of the W.C.T.U. met in the Cong. church [illegible] Sept. 16 with our Pres. Mrs. Lincoln in the chair. She led the Devotional exercises. We sang "What a friend we have in Jesus" followed by prayer by President. Miss Marsh resigned her office of Superintendent of Sabbath Observance in favor or Mrs. Emma Bailey. She was elected. Mrs. HIll resigned her office of Superintendent of Sunday School work, and Mrs. Stocks was elected in her place. 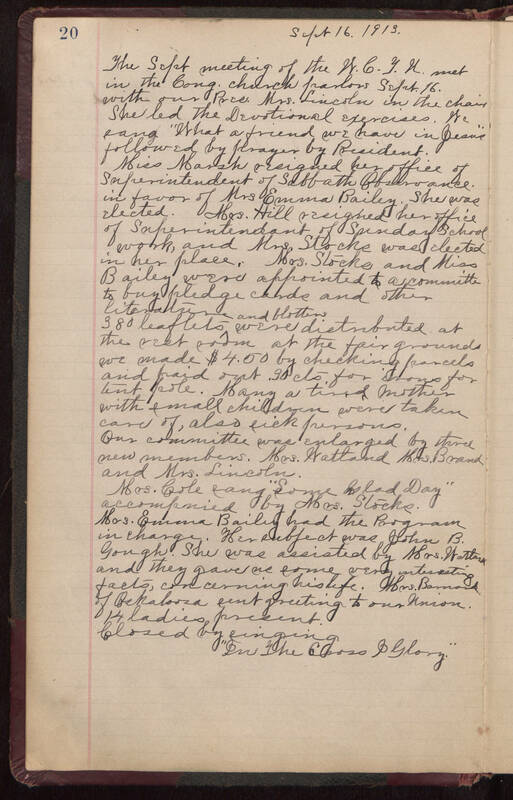 Mrs. Stocks and Miss Bailey were appointed to a committee to buy pledge cards and other [illegible] and blotters. 380 leaflets were distributed at the rest room at the fairgrounds. We made $4.50 by checking parcels and paid out .30 cts for [illegible] for tent pole. Many a timid mother with small children were taken care of, also sick persons. Our committee was enlarged by three new members. Mrs. Watland and Mrs. Brand and Mrs. Lincoln. Mrs. Cole sand "Some Glad Day" accompanied by Mrs. Stocks. Mrs. Emma Bailey had the Program in charge. Her subject was John B. Gough. She was assisted by Mrs. Watland and they gave me some very interesting facts, concerning his life. Mrs. Barnard of Oklahoma sent greeting to our Union. 14 ladies present. Closed by singing "In the Cross [illegible] Glory"